Hi-Wire Brewing is pleased to introduce the Hop Circus IPA program, an experimental hop series exploring the endless spectrum of hop flavors and aromas, to their line-up of flagship beers, with the first release from the program hitting shelves in October 2018. The Hop Circus IPA Series is an homage to Hi-Wire Brewing’s original launch of what is now their Speciality Program. Pushing the limits through hop exploration and creative ingredients, it is Hi-Wire Brewing’s goal to bring a new IPA to the market every three to four months. Each release from the Hop Circus IPA Series will feature different combinations of hops, fruit, or adjuncts, keeping the program fresh and interesting. The first release from the Hop Circus IPA Series is a Tropical White IPA (6% ABV). Blending tropical sweet tart flavors from mango and pineapple, with dank white grape and citrus notes from Hallertau Blanc and Citra. A heavy-handed portion of flaked wheat rounds out the flavors in this bright and silky brew. Available in 6-pack 12oz cans and draft, this beer, and all releases from the Hop Circus IPA Series, will see full distribution in Hi-Wire Brewing’s entire footprint. 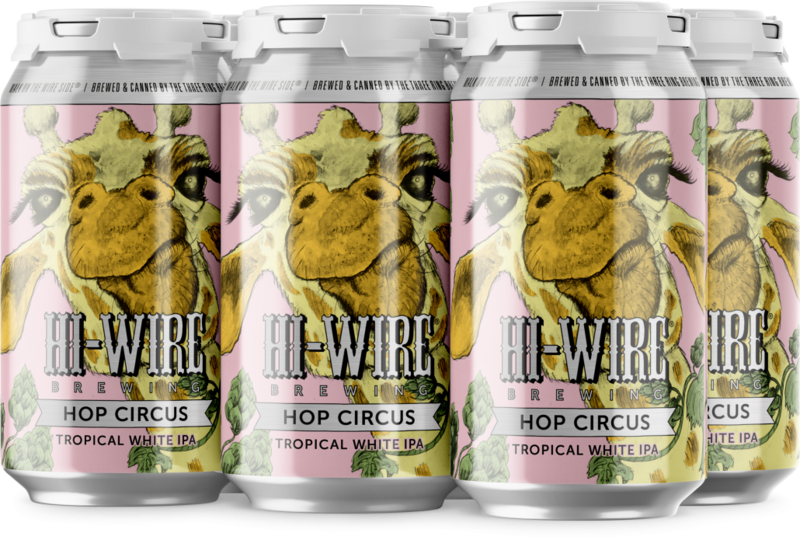 Hop Circus will be an addition to Hi-Wire Brewing’s current line-up of flagship beers including Hi-Wire Lager, Bed of Nails Brown, Hi-Pitch Mosaic IPA, Lo-Pitch Juicy IPA, and Hi-Wire Gose.